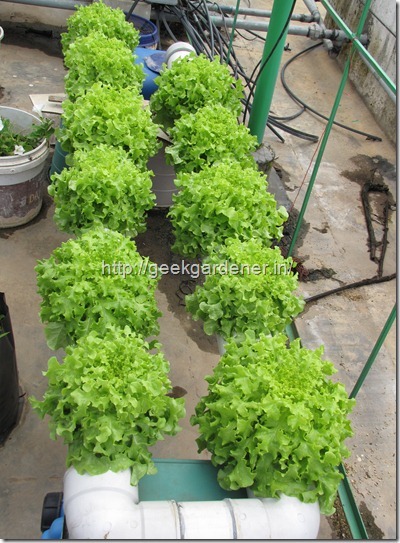 In the last post, we saw DFT method of growing leafy vegetables like lettuce. 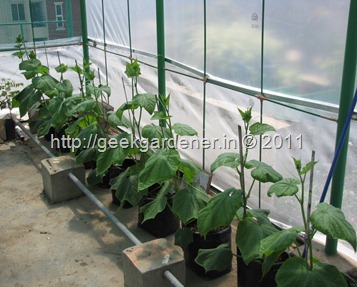 In this post, I am going to post about Hydroponic bag culture of European cucumber. Before we dive into the growing part, a little bit introduction about European cucumber won’t hurt. European cucumber aka the long English cucumbers. These cucumbers are seedless cucumbers. Why this is a good thing is, they don’t need pollination to happen for the fruit set. Inside the greenhouse, pollination is effected only by using bumble bees. Since these cucumbers don’t need pollination, there is no need for pollination using bees. Hence this variety is very suitable for greenhouse production. Also, European cucumbers have all female flowers. That means, every flower that blooms can become a fruit. Since all flowers can set, pruning is essential to get good quality and quantity of fruits. 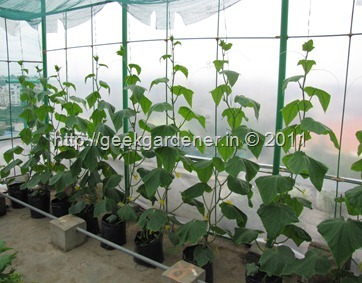 Cucumbers prefer warm growing conditions and they can handle summer in India. 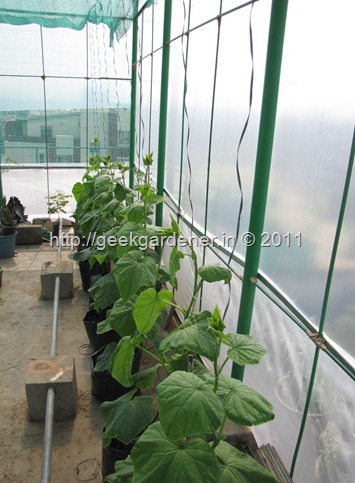 Greenhouse environment also suits the warm temperature needed for the cucumbers to grow. They consume more water especially in the hot summer days because of transpiration. 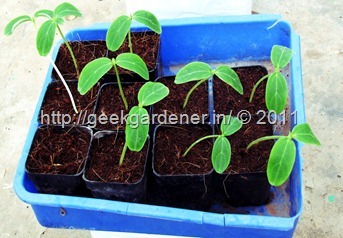 English cucumber seeds are sown in moist coir peat or cocopeat. The medium needs to be just moist and not too soggy. Medium that is too wet is prone to lot of fungal infections like damping off etc. It is good to choose the media that is free from any fungal infection. Sterilized and washed media is also available these days. Cucumber seeds can be sown an inch deep and the seed is covered with media on top. It is recommended that the trays, pots used are clean and sterilized before using if they were previously used. Once the seeds are sown they are covered with polythene sheets to keep them moist and create a humid micro environment. No further watering is necessary until they germinate. 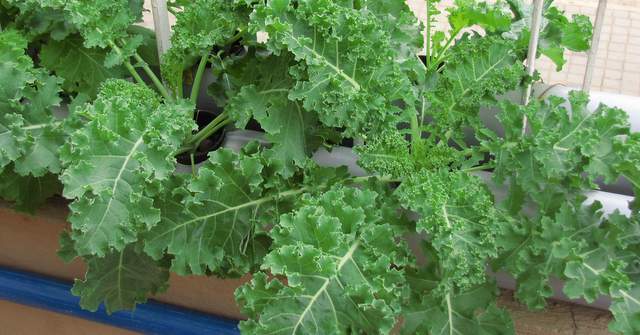 Commercial greenhouses use Rockwool blocks for germination. Rockwool is an excellent inert growing medium. It holds less water than coir peat and needs more frequent irrigation. Cucumber seeds germinate in 3-5 days. 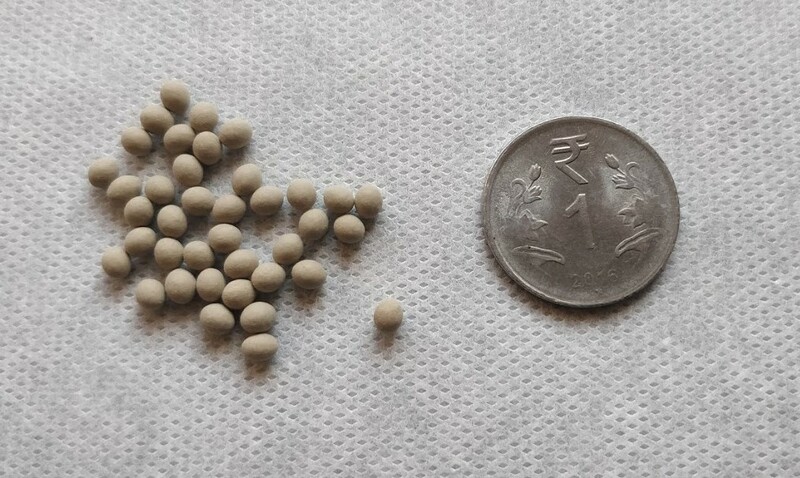 The optimum temperature for germination is about 24-28 C.
Once the cotyledons are fully open, it is time to water them with a half strength nutrient solution. The E.C of the nutrient solution must be kept at 1.0-2.0 until it is ready for transplanting. The seedlings at this point, grow very rapidly and sunlight is absolutely essential. Lack of sunlight will result in tall lanky seedlings. In the picture to the left, they plants are transplanted in a black poly bags that are 1 foot in depth and 10” inches in diameter. The plants were little lanky so I had planted them little deep. 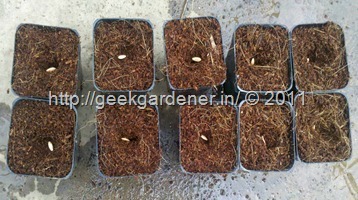 The poly bag is filled with media which is cocopeat (coco coir) in our case upto 2inch from the top. It is very important to use coir that is free from lots of salt. Care is taken to ensure the drainage is proper on all the bags. Proper drainage is essential and also keeps diseases at bay. Stagnant water leads to problems like root root. European cucumbers need up to 9-10 sq.ft per plant to grow.They occupy more space than tomatoes or pepper. High yield per plant is achieved. Plants are transplanted such that there is one plant per bag. This is for long cucumbers. For mini cucumbers, two plants can be planted. The spacing between the plants stops plant from touching each other. Disease spread can be avoided if the plants are spaced well and not too crowded. The plants are fed via a drip line that will supply the nutrients needed for the plants to grow. Once the seedling is transplanted they are irrigated with full strength nutrient solution. The plants grow very fast at this stage. The plants to the left are one month old from the date of sowing. They are growing very vigorously. Since the plants are creepers it is important to train them to climb vertically. I have put stakes in the bags after I transplanted them, so that the stems don’t bend and break. Cucumber plants have a very delicate stem. It is important to remove the tendrils, side shoots and flowers from the plant up to 7-8th leaf. This directs the plants to be vegetative in the initial phase. This is vegetative growth is important for the plant to be able to set fruits later. After transplanting, the plant will start to grow vigorously. Hence training and pruning should be done without fail. The plants are trained vertically with a twine.The twine is fastened at the base of the plant. Care should be taken to not put a tight noose around the plant stem. This causes wounds when the plant grows later and stops growth. Wind the plants around the twine string in the clockwise direction and be consistent with the direction. As the plant grows, remove the tendrils and the side shoots. Tendrils start clinging to leaves and fruits causing mis formed fruits. Allow fruits to be set after the 8th leaf from the bottom. This ensures vigorous growth for the plant and ability to set more fruits later. If the flowers in the bottom are set to form, there is nothing wrong. Cucumber plant can only support 5-6 cucumber at any point in time. So after that number, it automatically aborts all the flowers until the old ones are harvested. In this picture you can see the twine that is tied to a overhead wire. The plants are twisted around the twine. 40 days from the date of sowing. They are almost 6 feet tall and are flowering profusely. The plants were hand watered so far twice a day. Drip lines were also setup to automatically water at predefined timings. Two emitters were inserted per bag to ensure complete drenching of the bag. Drainage is about 15-20% of the nutrients supplied. This ensure there is no salt buildup in the bag. 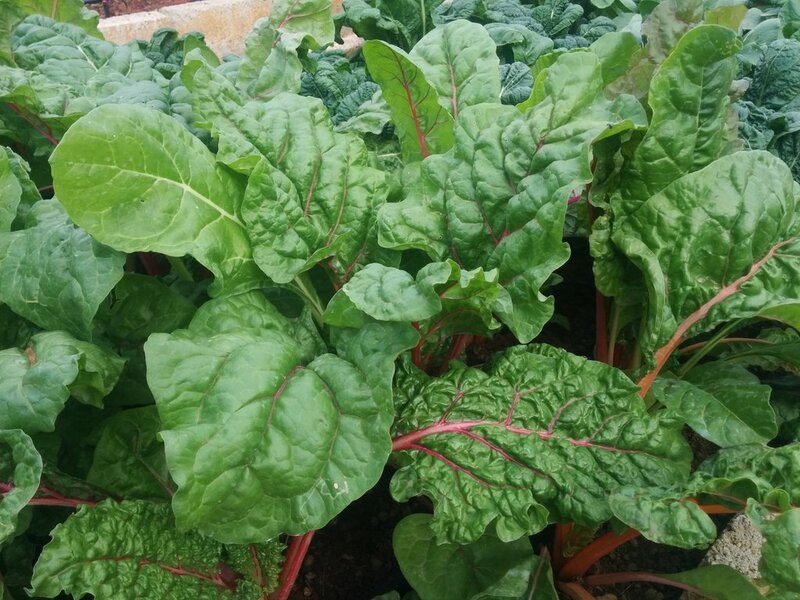 The leaves are periodically checked for pests/diseases/deficiencies. It also important to keep the plant balanced. Plant that is too vegetative yields less and the plant that is too generative will not yield throughout the growing season. The plants start flowering in about 40 days. As I mentioned before, all the flowers are female and they don’t need pollination. No running behind bees and no brushing around pollens. They just set fruit. Isn’t that wonderful?The fruits of this variety grow about 12-14 inches long and weigh about 500 grams per fruit. The fruit takes 10-14 days to develop from the day of flowering. The fruit has a dark green skin and is thin. So there is no need to peel them off and eat. Just eat the whole thing. Wow. That was a long post so far. Guess what! I am not done yet. There is part II to it. That is where I tell you how I harvested 12.5kg in the first harvest and 13 kg in the 2nd harvest. The plants are not done yet. After pushing out a whopping 25 kilograms. They are still yielding like crazy. If you liked this post, please don’t hesitate to share it with your friends and fellow gardeners! Use the social networking links below to spread the word and get more people to garden! 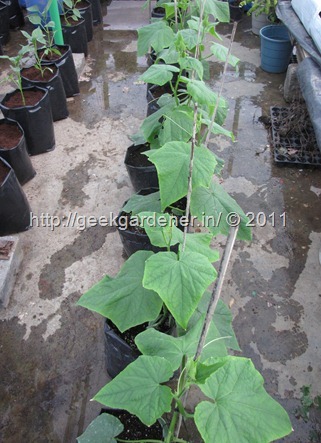 English cucumber seeds are available for purchase. nice!! u wont disclose the composition of the nutrient solution? Why not!. I will and It will be in coming parts of this post. Happy? I have been following your blog for years now, I love it! !Great work. Good that you specifically mentioned your twitter id, ‘thegeekgardener’ in this post. I had been following someone else with the twitter id ‘geekgardener’ \?//???? Really happy!! to know that it will come in the following posts!! Reading your blog for the last 2 months or so. Showed it to my husband and to my father who used to do lot of vegetable gardening. I and my husband are Inspired to do vegetable garden in a small land patch. Tried palak and coriander. harvested 10-15 leaves of palak so far. There is this rat who eats all the palak and leaves only stem for me! I would like to meet you someday. May be when you conduct next kitchen garden day. By the way Lettuce in your last post was awesome. Keep up your good work. You. Inspire us a lot. if 12 kg was harvested in the first harvest, from the picture i assume u had 10 plants. so most of the plant beared 2 fruit? even soil grown plants produce that much! 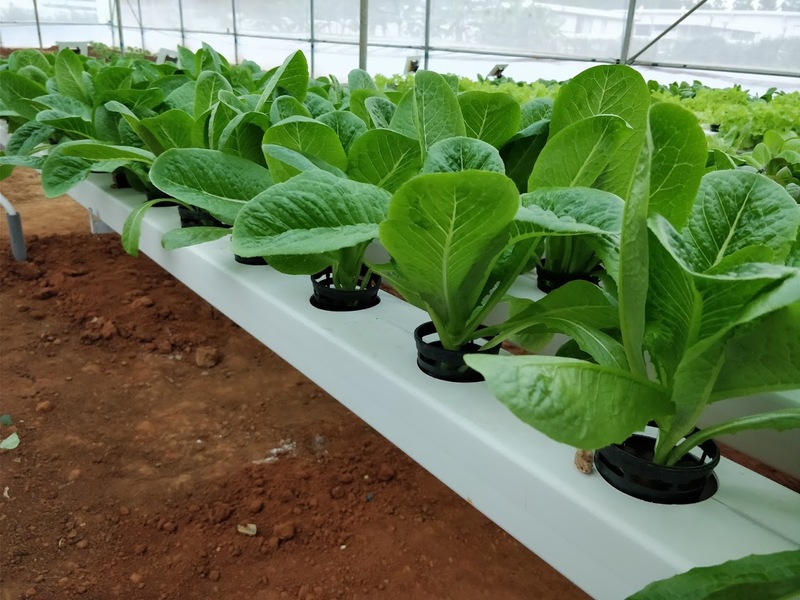 is there any significant difference in the produce of the plant bec of hydrophonic culture? 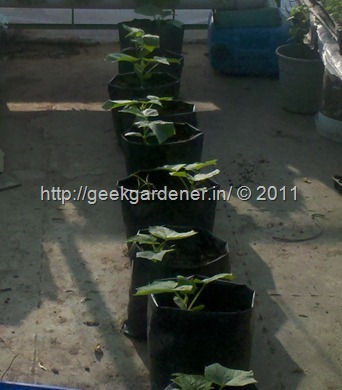 9-10 sq foot is the space i use to grow cucumbers using cocopeat and compost. in what way hydrophonic culture makes a difference? Hi GG, I wrote a comment on your propagating hydrangea through cuttings post.. actually I have been trying really hard to get hold of a Hydrangea.. but Having no luck.. can you please help me in finding a sapling please?? I’ve been following your blog for quite sometime now. I’d like to know where you get hydroponic materials for your garden. Thanks for sharing such an informative article. Do you still have some more beit alpha cucumber seeds that you could share with me? Too good! 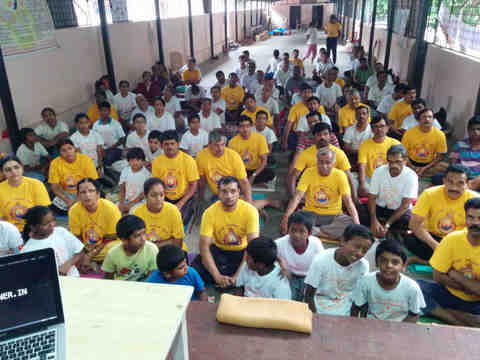 One can only say ” adhisayama irukku”. Another thing I observed, you are fast reaching a stage set for writing a book on these topics. We are looking forward to that! Hi, very much motivated by the vegetables grown on roof top. Hve purchased a new house with terrace in Mumbai. Pl. help to grow vegetables like you. Do we require to recharge the coco peat medai before plantation for hydroponic cultivation in greenhosue for Cucumber / Color Capsicum. I read through the wonderful post. It mentions seeds sowed in cocopeat and later transplanted to cocpeat in a polythene bag. I have a couple of queries, May be I am missing something..
a) Would this be only cocpeat or cocopeat and soil mixture?. Considering that topic says soilless, I belive it is only cocpeat? b) How is this Hydroponics? Is it because you add nutrition supplement to cocpeat medium in which the plants are transplanted? Can you write more about the nutrition supplement? Is it available at your store? Can we buy ingredients and prepare? Would addition of this nutritional supplement, be considered as organic? or chemical? 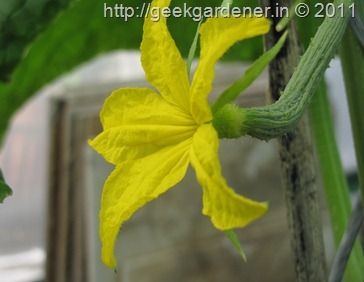 I have read both part 1 and part II of your post on ‘Soilless Cucumber Production in greenhouse’. All little details for successful cultivation of the cucumbers have been discussed. I have found the posts to be very useful. Want to know about nutrient availability in India. Also let me know what will grow in climate of Goa. What did u do to have good drainage in your black polybags? Poke lots of holes in the bottom of the poly bag.